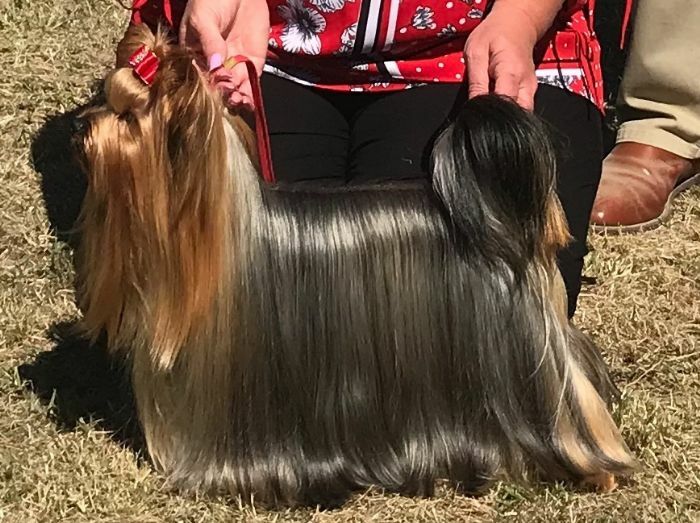 General Appearance: Long coated, coat hanging quite straight and evenly down each side, a parting extending from nose to end of tail. Very compact and neat, carriage very upright conveying an important air. General outline conveying impression of vigorous and well-proportioned body. Characteristics: Alert, intelligent toy terrier. Temperament: Spirited with even disposition. Head And Skull: Rather small and flat, not too prominent or round in skull, nor too long in muzzle, black nose. Eyes: Medium, dark, sparkling, with sharp intelligent expression and placed to look directly forward. Not prominent. Edge of eyelids dark. Ears: Small, V-shaped, carried erect, not too far apart, covered with short hair, colour very deep, rich tan. Mouth: Perfect, regular and complete scissor bite, i.e. the upper teeth closely overlapping the lower teeth and set square to the jaws. Teeth well placed with even jaws. Forequarters: Well laid shoulders, legs straight, well covered with hair of rich golden tan a few shades lighter at ends than at roots, not extending higher on forelegs than elbow. Body: Compact with moderate spring of rib, good loin. Level back. Hindquarters: Legs quite straight when viewed from behind, moderate turn of stifle. Well covered with hair of rich golden tan a few shades lighter at ends than at roots, not extending higher on hindlegs than stifle. Docked: Medium length with plenty of hair, darker blue in colour than the rest of the body, especially at end of tail. Carried a little higher than level of back. Undocked: Plenty of hair, darker blue in colour than the rest of the body, especially at end of tail. Carried a little higher than level of back. As straight as possible. Length to give a well balanced appearance. Gait/Movement: Free with drive; straight action front and behind, retaining level topline. Coat: Hair on body moderately long, perfectly straight (not wavy), glossy, fine silky texture, not woolly, must never impede movement. Fall on head long, rich golden tan, deeper in colour at sides of head, about ear roots and on muzzle where it should be very long. Tan on head not to extend on to neck, nor must any sooty or dark hair intermingle with any of tan. Colour: Dark steel blue (not silver blue), extending from occiput to root of tail, never mingled with fawn, bronze or dark hairs. Hair on chest rich, bright tan. All tan hair darker at the roots than in middle, shading to still lighter at tips.